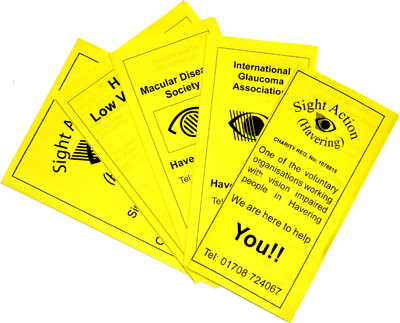 Sight Action (Havering) is a small independent registered charity, dedicated to working with, and on behalf of, vision impaired people within the London Borough of Havering, and to raising awareness of their needs to those responsible for service provision. 1. To support and inform people of all ages with a vision impairment, resident in the area, in order to minimise social isolation and promote and encourage independence. 2. To adopt a dynamic, friendly and flexible approach to vision impiarment as a means of raising awareness in the community. 3. 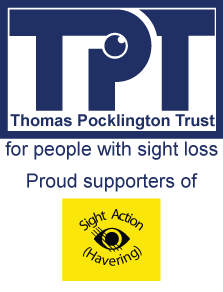 To support, advise and provide information to those at risk of losing their sight, or already living with sight loss. 4. To input into strategies, and the planning of services, likely to have an impact on those at risk of, or experiencing, sight loss. Sight Action works collaboratively with a wide range of national and local organisations and societies and is supported in its work by East London Vision (ELVIS) which is an umbrella body covering seven East London Boroughs; The Thomas Pocklington Trust, one of the national sight loss charities, with a particular interest in London, and is affiliated to Essex Blind Charity. Copyright © 2019 Sight Action Havering. All Rights Reserved.